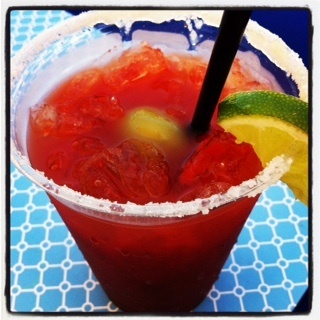 One of the best Bloody Marys I've had to date was poolside at La Costa Resort in San Diego. It was so perfectly made that once I finished it, I left my book, my sunshine, and even my flip-flops to find the bartender who crafted it (I'm weird like that). He was proud to share his recipe and very disappointed that I wouldn't agree to another one. But I assured him that I'd sing his praises to anyone who'd listen (or read). But I wasn't at the pool the whole time. No, no. Smothering my skin with baby oil at 17 while life guarding at the local pool means my sun time is limited (I'm just not comfortable with the idea of a facelift at 40). I also hit up the indoor Blue Fire bar for a few glasses of Layer Cake Cab and the Diversions Lounge (the stupidest name ever for a lobby bar) for some Knob Creek. And stop judging me for how many bars I visited. This job is not as easy as all you people think. The pools are amazing with water slides and water play areas for the youngsters, the hospitality is downright superb (though I prefer a staff that incessantly says mahalo), the golf course just looks like it would be amazing if I knew anything about what amazing golf courses look like, and I found $3 in the hallway. So there you have it. This is one awesome place to vacation. Subscribe to our blog or follow us on Facebook and Twitter!